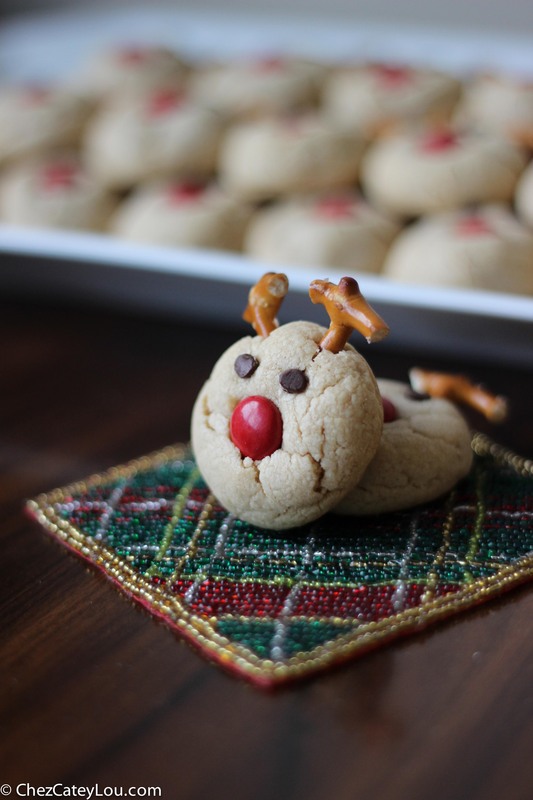 Soft peanut butter cookies are decorated to look like little reindeer! 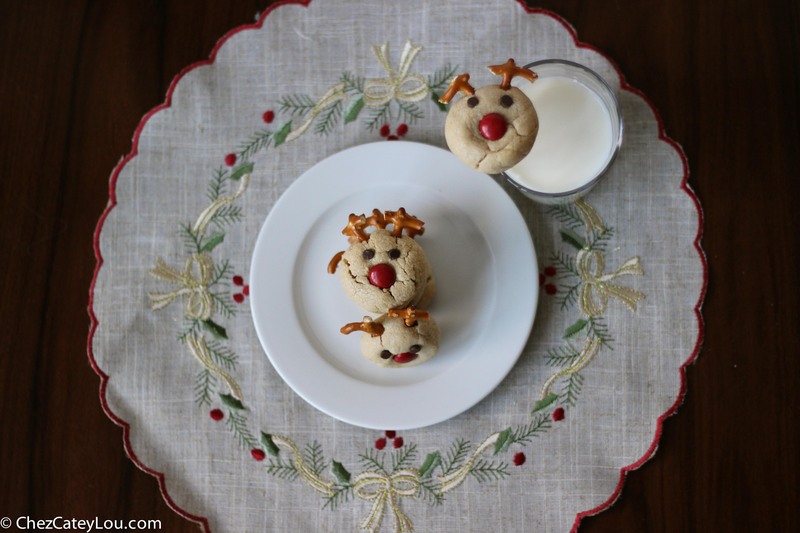 These Peanut Butter Reindeer Cookies are the cutest Christmas cookies ever! There have been a lot of cookie recipes on Chez CateyLou lately like these gingerbread cookies and these white chocolate cranberry cookies, but I saved my favorite one to share with you today. 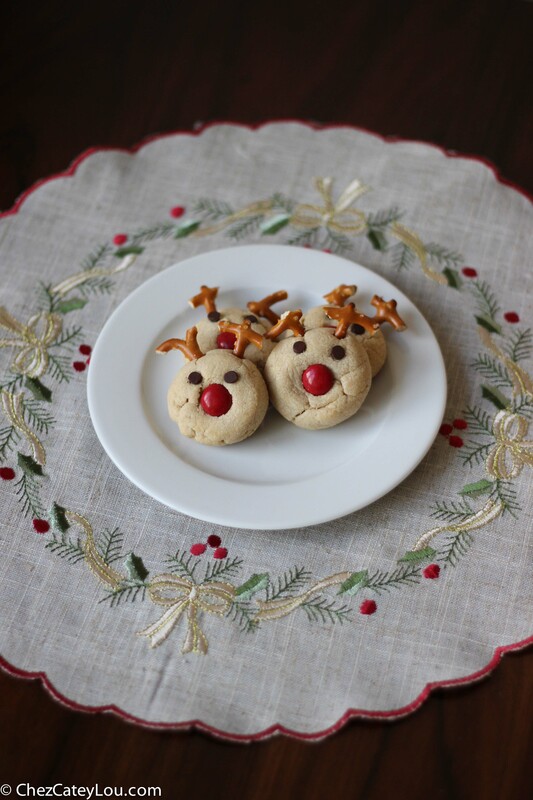 These Peanut Butter Reindeer Cookies are the cutest cookies I have ever made! Look at those little faces – aren’t they precious? And as an added bonus, they taste amazing too. So on to the building blocks of these reindeer cookies. 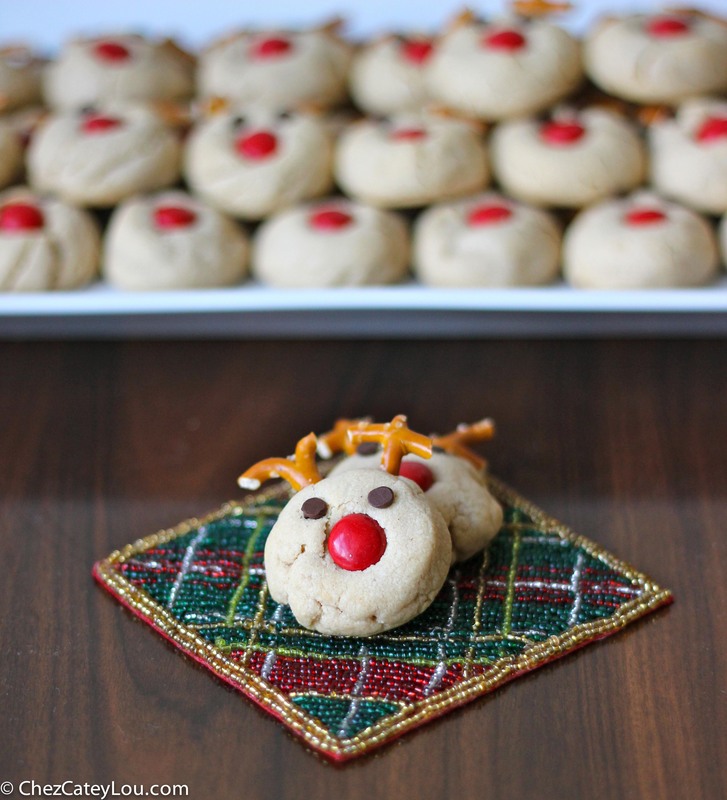 The key to making these cookies is to have all of your decorating ingredients lined up and ready to go: mini chocolate chips for the eyes, red M&M’s for the nose, and broken pretzel pieces for the antlers. When the cookies come out of the oven, quickly (and carefully! the cookie sheet is hot!) start making the reindeer. Start with the nose – press an M&M into the middle of the cookie. This will kind of spread the cookie out a bit so that it is flat and round. Then put two mini chocolate chips on for eyes. And finally, put the pretzels in for the antlers. I only put 10 – 12 cookies on a sheet at a time so that I can decorate all the faces while the cookies are still hot. Once they start to cool and the dough hardens, you won’t be able to put the pretzels into the cookie. You can definitely fit more dough balls on the sheet, but resist the temptation! 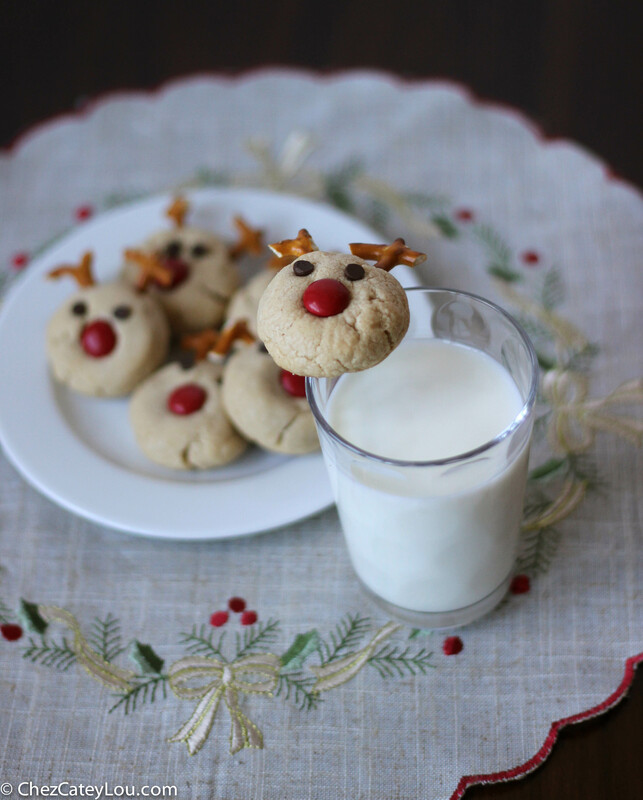 These reindeer cookies will be the hit of any holiday party and will steal the show on a Christmas cookie platter. They are going to become a new holiday staple in my household! In a large bowl, beat together butter, peanut butter, sugar, and brown sugar on medium speed until light and fluffy, about 2 minutes. Add egg and vanilla extract and mix until combined. In a small bowl, whisk together flour, baking soda, and salt. Add the dry ingredients to the wet ingredients and stir until just combined. Roll the dough into 1-inch balls, and place at least 1 inch apart on cookie sheet. Bake only 10 - 12 cookies at a time. Refrigerate the bowl of dough in between batches. Bake for 7 - 9 minutes, until the cookies are just set. 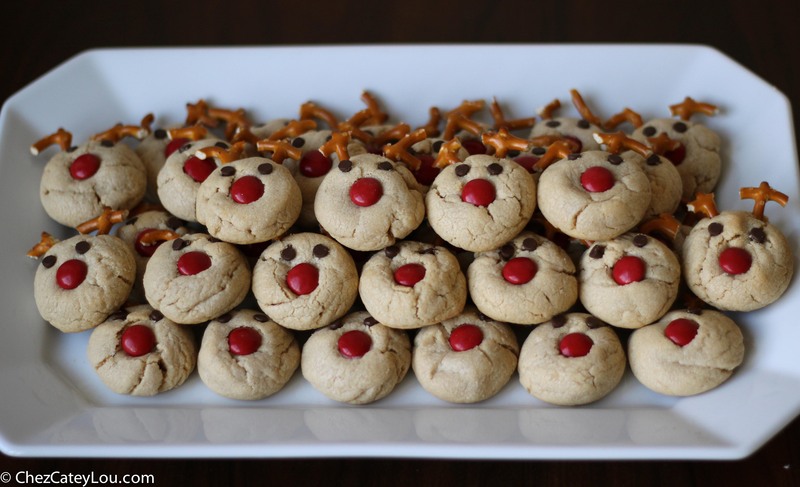 Immediately place one M&M in the center of each cookie for a nose (press down a bit if your cookies aren’t flat enough), 2 mini chocolate chips for the eyes, and 2 pretzel pieces at the top for antlers. Carefully transfer the cookies to a wire rack to cool completely. These are adorable. And probably pretty darn delicious too. So creative… love the idea! Totally perfect for holiday parties! Thank you so much, Chris! They are really the perfect Christmas cookie, cute and tasty! How cute are these! I bet they are delicious and fun to make. Thanks, Megan! They were so much fun to make, and to eat! Thanks, Sinead! I am obsessed! 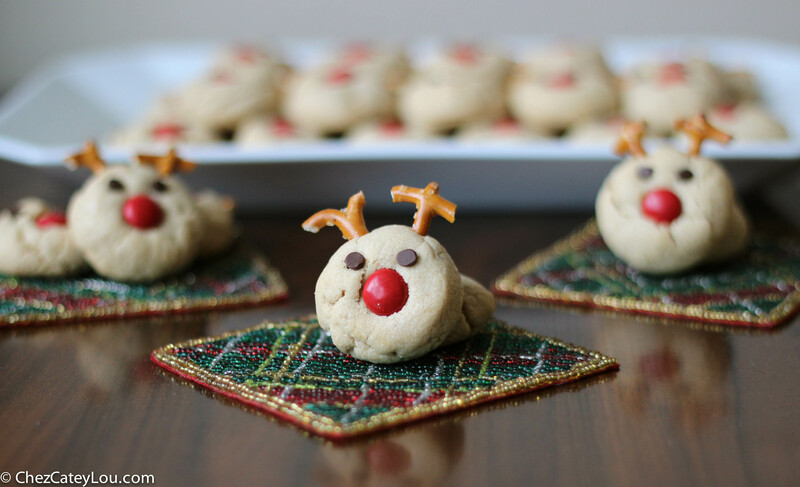 These are just like the ones I wanted to make with my cousins this Christmas – but cuter! Thanks for the step by step instructions, too. They look incredible! Thanks Katie and Cate! Thanks, Ela! They are the happiest little cookies! These cookies are adorable! So festive and fun to eat. My nieces would love them! Lovely post Cate. Thank you so much, Anne! These would definitely be a hit with kids! 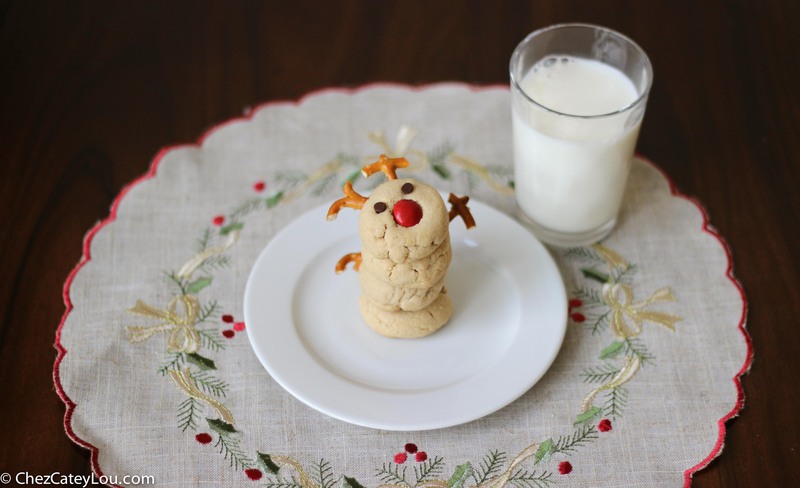 So adorable, perfect for kids to leave out for Santa on Christmas Eve. Merry Christmas. I can hardly take the cuteness of these! Thanks, Joanne! The cutest cookies I have ever made, by far! Oh gosh. 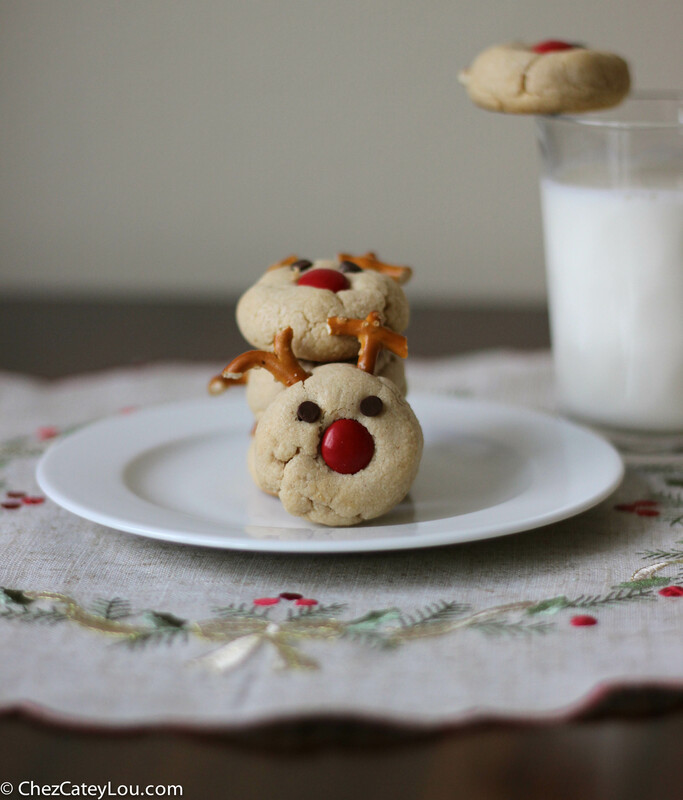 These are so adorable – I can totally still make these even though Christmas is over, right?! Thank you so much! You can definitely make these even though Christmas is over!!! Wow, this looks so good! I was wondering if I could use this recipe and photo in a school project. Thanks! Hi Elizabeth! Sure, you can use the recipe and photo in your school project, as long as you link back to my site. Good luck! Aren’t these just the cutest! What a fun idea! Thanks Michelle! They are such a fun cookie for Christmas! I am a sucker for cute food, I love these Cate! Pinning! I think these are just the cutest cookies! My girls would go crazy over them! Can crunchy peanut butter be used? Hi Polly – I think you could use crunchy peanut butter, the texture of the cookies would just be a little different. Let me know if you try it! Yes! I’ve always used creamy and tried crunchy this one time…..I’ll never go back to creamy! The texture is just right and it seems the cookies want to crumble less. My lo (almost 3 yo) LOVED doing this. Yes, they weren’t perfect but the joy on her face and the excitement in her squeeeeeeeeeeeeeeealing was worth every additional mess to be had!